Can you recommend a reasonably-priced hotel in the French Quarter? Which hotels are in walking distance to the French Quarter? Are there any hotels that provide free parking? What hotels are on the Mardi Gras parade route and which ones have balconies? Where is a quiet place to stay, out of the noisy parts of the Quarter? Do any hotels offer special parking rates while we go on the cruise ship? Which hotels are located in the safest area of New Orleans? Which hotels offer the best pools? How close is New Orleans to the beach? Don't see your question? Click here to ask us. We'll be happy to help! If price is a concern, we suggest traveling during our off-season (summer and early fall) when you can stay in some of the nicest hotels at a great price not offered during our peak seasons. You can also check out the “discount” section of BestNewOrleansHotels.com for hotels offering year-round value and the special packages often offered on their individual websites. Looking for other ways to save? Check out “How to Get a Hotel for Less”. Let us know if you have questions about a particular hotel. We’ll be happy to help! All hotels in the Convention Center and CBD are within easy walking distance to the French Quarter; however, all New Orleans hotels have easy access to the Vieux Carre using our world-famous streetcar or shuttles offered by individual hotels. Do any hotels provide free parking? With any major metropolitan area, parking is at a premium. While some hotels in the Metairie suburb of New Orleans or in the Garden District (10 – 15 minutes away by car) do offer free parking, you can expect to pay anywhere $20 to $40 per day for parking in the French Quarter or CBD. Some of the best deals we recommend are self-parking at Le Richelieu in the Quarter for just $20 a day or and Hotel Provincial offers a $26 per day valet parking. The amount is typically within the terms of your reservation and on the site under “amenities.” However, some hotels offer special parking packages. Just click the Packages or Specials tab of their website or give them a call. Usually, visitors don’t need a car while visiting New Orleans because of the close proximity to major attractions from hotels in the French Quarter and CBD. Those in the Garden District have easy access to safe, inexpensive public transportation including the streetcar along St. Charles Avenue and the Riverfront (a ride from the French Quarter to Uptown is only $1.50 each way!). Balconies along the parade routes are limited and generally reserved by the hotel’s corporate clients. However, it is important to have a location nearby, having easy access to a restroom is one of the few things we take seriously during Mardi Gras! 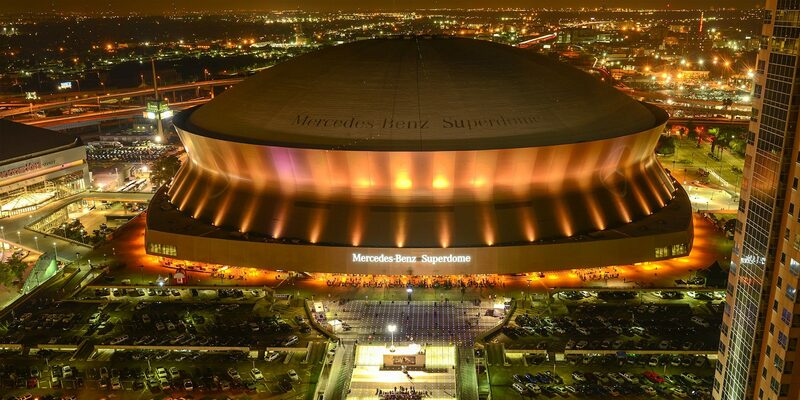 Some of our favorites are Prytania Park and Holiday Inn Superdome. What hotels offer a balcony in the French Quarter? Some of our favorite French Quarter hotels offer balconies overlooking the action in the Quarter as well as courtyard balconies overlooking beautiful pools and lush courtyards. These hotels include Maison Dupuy, Hotel Provincial, Hotel Villa Convento, and Hotel Le Richelieu. If you want to catch up on some R&R and enjoy the French Quarter too, we recommend staying at least a block or two away from Bourbon Street or perhaps the Garden District or CBD. The Carriage House at Maison Dupuy is a perfect choice for the luxury traveler, nestled in a world of its own — including a private courtyard. Click here to see our other choices for a relaxing time! Currently, we recommend Holiday Inn Superdome and Prytania Park Garden District Collection for the deals for cruise ship parking. Here at BestNewOrleansHotels.com we recommend only those hotels that we would feel comfortable staying in with our loved ones. The downtown New Orleans area, including the world famous French Quarter, is as safe as any other metropolitan area. Like with any major city, you should try to stay in high pedestrian flow areas and constantly be aware of your surroundings. You can also check with your hotel concierge for shuttle services and safety tips. The closest beaches to New Orleans are along the Mississippi Gulf Coast — about an hour away. However, just two more hours and you’ll be lying on the sugar-white sandy beaches of Florida!